Previous posts on fertility rates by race: 1980-2008 and 1980-2010. Note that this Total Fertility Rate data is based on the race of the mother. 2,130,000 babies born to White Non-Hispanic women (54.1%). 580,000 babies born to Black Non-Hispanic women (14.8%). 900,000 babies born to Hispanic women (22.9%). 270,000 babies born to Asian women (6.8%). 46,000 babies born to American-Indian women (1.2%). Note: The size of the child generation is here based on a replacement fertility of exactly 2.10. Higher mortality rates among Blacks and Hispanics partially offset some of this difference. That is, Blacks and Hispanics may have a slightly higher replacement fertility than 2.10. (2) Whites. The good. White Non-Hispanic TFR has been remarkably stable over the past 25 years. White births recovered to 54% of total births by 2013, up from reportedly crossing below the 50% threshold a few years ago (the 2010-2011 period). The bad. 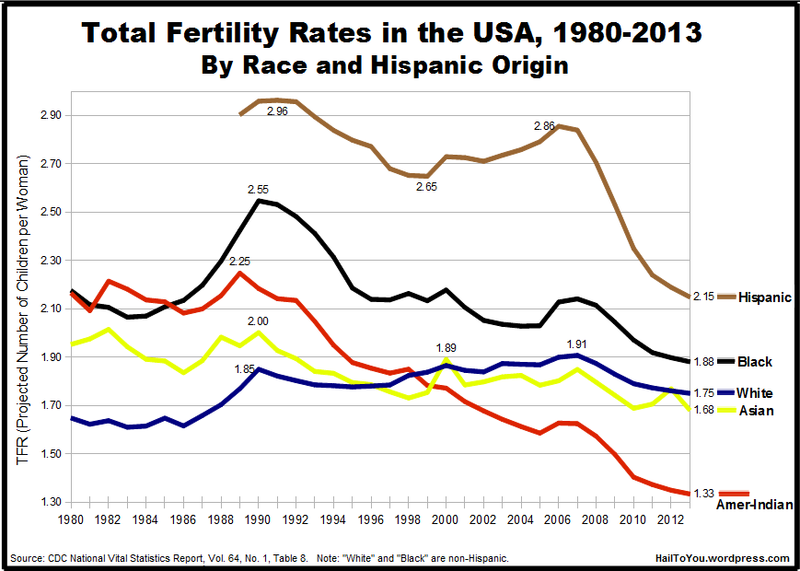 White Americans have had sub-replacement fertility since either 1970 or 1971 and TFR reached quite low depths in the later 1970s and 1980s. The current 1.75 children/woman for White women drops to around 1.6 if counting only “White couples,” as about 10% of White women who give birth have a Nonwhite partner according to other data. The verdict. A sustained “all-White” 1.6 TFR means that each child generation is about 75% the size of its parent generation; this means steady population contraction, but no collapse; it puts U.S. Whites better off than very many other ethnic majority populations in the rich world. (3) Hispanics. The sharp downward slope of the Hispanic TFR line from the height of Bush’s Housing Bubble in the mid-2000s to (very likely to be) below replacement level by the mid-2010s is obvious. What it implies may not be: It suggests the Bush economy was a kind of “Hispanic fertility subsidization” affair, even if not intentionally, even more than for Blacks or Whites. The natural state may have been for the Hispanic TFR line to descend steadily its level circa 2000 (2.65) to its present 2.1. Everything above that hypothetical line is, or can be seen as, “extra births” due to the Bush economic bubble. This is a simplification but I think largely correct. The Other Hispanic category (probably largely Central American) is the only one with a TFR in the 2010s that exceeds its 1989-2012 average. (4) Blacks. A concern of generations past in the USA was that Blacks would outbreed Whites. This relatively recent data bears out that this was a justified fear even as late as the 1990s. (Black TFR was often more than 0.5 points above White TFR in the 1980s and 1990s, which, sustained over time, is very substantial). Then fertility rates converged. The Black fertility edge has, since the early 2000s, been small. By 2013, it was just a 0.1 TFR point advantage. (4a) Black American Fertility vs. Black African Fertility. Blacks in Africa remain the most high-fertility people in the world (See Steve Sailer’s “The World’s Most Important Graph“. Blacks are said to follow a more “r-selected” (higher fertility) reproductive strategy, whereas Whites tend to be “k-selected” (lower fertility). Yet U.S. Black and White fertility has very nearly converged. How? (5) American-Indians. The steady decline we see in Amerindian TFR is troubling and begs an explanation. From a robust 2.25 in 1989 to by 2013, 1.33 (by far the lowest). This is as low as the lowest fertility states in the world in East Asia (Japan, South Korea). Amerindian TFR declined almost every single year between ’89 and ’13 except briefly during the height of the Bush Housing Bubble. American-Indians also have a high outmarriage rate. (6) Asian. The category “Asian” is useless, as it includes too many disparate groups to make reasonable suppositions about trends. The CDC does not break down the data for Asians further. Data source: Official data on total fertility rates by race and Hispanic origin are calculated and released by the U.S. CDC every year, buried rather deeply in their reports but accessible to those committed to finding it. The graphs above were made by me. Similar graphs are not produced by the CDC. This data comes from the CDC’s National Vital Statistics Reports, Vol. 64, No. 1, released on January 15, 2015. Total Fertility Rate data broken down by race and Hispanic origin is in Table 8 of that report, page 28 and onward, except for Asians and American Indians, the data for which can be found in Table 13 (pg.38) of the same report. The graph is also based on previous Vital Statistics reports, going back to Vol. 59, and following amendments by the CDC. The final fertility data for 2014 will be released in January 2016. Preliminary data (p.4) suggests that overall U.S. TFR ticked slightly up between ’13 and ’14, going from 1.858 to 1.862, but this change is so minuscule it may even be wiped out in the final data. This entry was posted in Uncategorized and tagged africa, american indians, blacks, cdc, central americans, cubans, demography, diversity, economy, fertility, george w. bush, hispanics, housing bubble, immigration, puerto rico, race, racehist, steve sailer, total fertility rate, usa, whites. Bookmark the permalink. Much appreciated graph. I knew the jist of it but I haven’t had such a useful reference before. I suspect it will get referenced quite a bit . r/hapas is a known hate speech brewing subreddit. Most of them are trolls. I have a half asian daughter who is turning three this year and she doesn’t look Asian at all. Maybe to you, I’m assuming you are a white female, half asians are asian, but they are not asian to us full asians. It remains an open question whether “Hapas,” which I take to mean half-East-Asian/half-European, can stake out a coherent ethnic identitarianism. I don’t know enough about the subject to guess, really. oh great, another Asian woman who was sicced like a dog on white men by her Asian parents, who told her to marry a whiite man at any costs. or are you just an Asian gold digging prostitute? counting on that myth that Asian women are more submissive to get you your white gold that you’re mining? Miss Minnie, some representative examples of the experiences you mean would be helpful. I am half Asian but I look and feel white and consider myself a white nationalist.Just saying. I haven’t seen any data on births to Asian women by race of father. If you have any, please share it, Thanks. Billare wrote: Look at that steep plunge in Hispanic & Amer-Indian fertility rates after the Great Recession begins. Whyvert wrote: why is Amerindian so low? Any theories? Billare wrote: Very little clue, but I have to wonder how much changed self-identification creates these trends. By that I mean are Native Americans more Native American or more White today than they were in 1980. They are small group proportionally; shift in ID by Whites w/ minor ancestry would drive substantial convergence. It is probably substantially malaise though. Fertility rates remain higher for [Canadian] Aboriginal women compared to non-Aboriginal women. In the 1996 to 2001 period, the fertility rate of Aboriginal women was 2.6 children, that is, they could expect to have that many children, on average, over the course of their lifetime; this compared with a figure of 1.5 among all Canadian women.17 In the same period, the fertility rate for Inuit women was estimated to be 3.4 children, compared with rates of 2.9 children for First Nations women and 2.2 for Métis women. A brief report published by Thornton et al. (1991) presents data from the 1910 U.S. census showing that early in this century, fertility rates for American Indians were relatively low. The mean number of children even born to so-called “full-blood” couples was 4.5, notably lower than the number born to interracial couples involving mixed-race and full-blood Indian spouses, with 5.4 and 5.1 children ever born, respectively. Likewise, nearly 11 percent of endogamous full-blood couples were childless in 1910, compared with about 8 percent of full-blood/white couples and 4 percent of mixed-blood/white couples. These decidedly lower rates of fertility among full-blood American Indians led the Census Bureau to predict their eventual disappearance (U.S. Bureau of the Census, 1915). Deep cultural pessimism afflicting Amerindians on reservations may have explained their low fertility, the authors say. [In the 1980s,] the fertility of endogamous American Indian couples or American Indians residing on reservations was noticeably higher than that of exogamous couples or couples living in urban areas. Predictably, endogamous American Indian couples are more common on reservations (Snipp, 1989). @Billare these strongly match homeownership by age/race cohort breakdowns too. Need to do Headship rates but assume similar pattern. these strongly match homeownership by age/race cohort breakdowns too. Need to do Headship rates but assume similar pattern. Affirmative action lowers White birth rates. Please save a copy and forward this. Very good work. Great post, one I’ll be bookmarking to dispense as reference on a regular basis, thanks. only low class whites have lots of kids. smart whites know it is better to have less kid and make them amazing. quality is better than quantity. Dumb whites have nothing else to be proud of except their skin color. Actually no, it is the other way around. But you wouldn’t understand it. Not just skin color, but also our beautiful white facial features and our nice hair and eye colors and hair texture. I am proud that I don’t have a flat, wide nose, huge lips and telephone cord Afro hair. If you go back to the first half of the 1980s, the evidence suggests that the Hispanic Total Fertility rate was considerably lower than it was for a number of years after amnesty that passed in 1986. The amnesty set off a Baby Boom among foreign-born Mexican residents. Here are graphs for California going back to 1982 showing the impact of amnesty on TFRs. Emilio A. Parrada of the U. of Pennsylvania has done paper, How High is Hispanic/Mexican Fertility in the U.S.? Immigration and Tempo Considerations on Mexican fertility in the U.S.
Mexican women tend to have a whole lot of kids right after arriving, then realize a number of years later, uh, oh, raising kids in America is lot more expensive than I figured when I first got here. So, when immigration drops, like after the Housing Bust, Mexican fertility in the U.S. drops sharply as well. Fertility data go by the race of the mother. But quite a few white moms nowadays give birth to mixed-race kids. How can social science researchers take the “coal-burning” phenomenon into account? What is the coal burning phenomenon?? Only thing I found was called coal rolling when conservatives make their trucks immit more black smoke from the exhaust to piss of liberals. The fact that we are all American. Comparing black Americans to Africans who live in two different continents and have numerous different cultures is totally irrelevant to your case. Sorry for my grammar and misspellings I didn’t have time to double check my post. Today the average Black American is 31 Years-old while the average white American is 45 Years-old. There were actually more whites under the age of 65 in 1970 than today. Hisanic is not a race. It defines a group by language. Spanish is the defining parameter of Hispanic, not race. This paper is not science.